I thought to further inspire you today on the first day of spring that I'd link you to some fabulous flower making tutorials online that may get your creative juices flowing from craft queen, Martha Stewart. 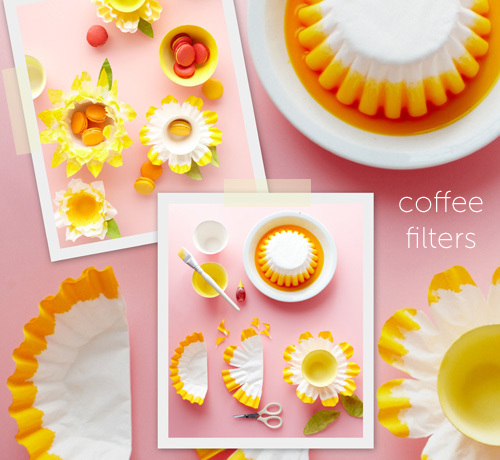 The first are these fab coffee filter flower baskets. You can change them up by adding stems and turning them into bouquets. There is a video that you can watch here to get you started. Try to venture out on a limb and think of other ways to apply this craft idea. You may imagine them as garlands, perhaps? 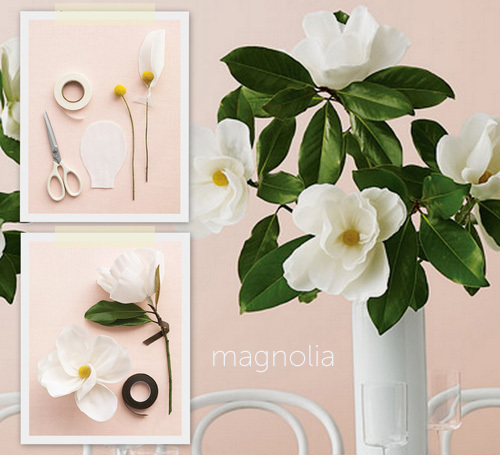 I love this magnolia blossom how to. I remember watching my mother work with crepe paper to make flowers when I was a little girl. She made them beautifully and with great care. She even made them for my bridal shower, the room was filled with crepe paper flowers - some huge, some dainty, along with fresh flower arrangements too. Her creativity influenced everything that I do, she taught me how to see the world as having endless possibilities and countless approaches. She loves taking the conventional and flipping it upside down. Unconventional yet approachable - a fine line, but she never went too far. She rarely crossed over into the crazy craft lady territory where unconventional becomes tacky or looney. When crafting, I try to exercise the same restraint and edit things when I approach that crazy craft lady zone. For me, that's a sign that I need to step back and step away from the glue gun. Some tutorials that you can link to: 1. Crepe paper flowers are affordable and add a soft touch. 2. This is a fab tutorial, too. 3. Such a beautiful DIY addition to clothing or to a tabletop (A video showing how to do this can be seen on this page). 4. For spring, I suggest trying this DIY with some colorful papers, but this tutorial can put you on the right track. 5. I love this branch idea with birds from the craft store and paper flowers on the branches. 6. More lovely paper blooms with a helpful how-to. Doesn't this inspire you to get creative for spring?